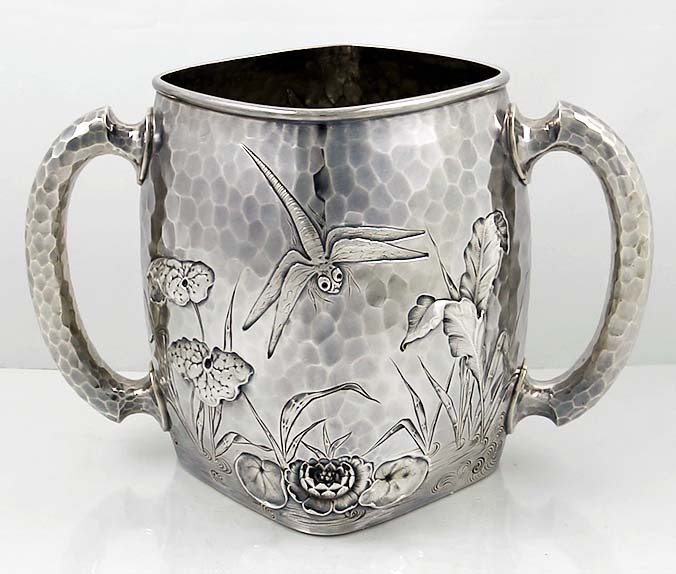 This Dominick & Haff antique sterling hand hammered square two handle loving cup was found in remarkably good condition and has a spot hammered surface chased with Japanese pond life including dragon flies and water plants. Dominick & Haff was known for this series and it stands alone out there different to anything else made in the 1800s. The quality can only generate the respect of collectors and silver experts. We found this article complete with the original documents from 1881 when presented to the doctor mentioned in the inscription on the base.